Beautifully engraved Specimen certificate from Snowball.com. This historic document was printed by the American Banknote Company and has an ornate border around it with a vignette of the Snowball company logo. Rick Boyce is shown as President. 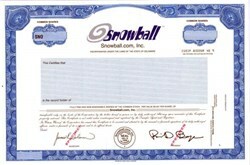 Snowball.com was the leading online network for Generation i and the companies that want to reach its population of Web-centric young adults. Headquartered in San Francisco, Snowball aggregated top Generation-i-produced Web sites and brought its active Net-centric audience to companies that offer products and services targeted to the demographic. The company was consistently ranked by Media Metrix as one of the largest consolidated properties on the Internet. Its primary networks include ChickClick.com, IGN.com, and PowerStudents.com. All sites include content developed by Snowball.com and its partners, as well as links to other related sites. Snowball.com, changed its name to IGN Entertainment. IGN Entertainment, through its flagship network IGN.com, is the Internet's leading information and entertainment destination for teen and young adult gamers. IGN serves its audience by providing both free and subscription-based content and services. IGN's award winning content -- two Webby People's Voice Awards and two Wired Magazine's Readers Raves Awards -- attracts more than eight million unique visitors a month, including over 5.7 million registered users and more than 76,000 paying subscribers. IGN offers its business customers a full spectrum of integrated marketing solutions to reach this large web-centric audience. These products include fixed placement and impression-based advertising, sponsorships, permission marketing, custom publishing, e-commerce, direct e-mail marketing and content licensing.